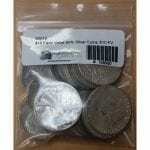 90% United States Silver Coins Often referred to as "junk silver", circulated, common date Unites States 90% silver coins such as dimes, quarters and half dollars dated 1964 or earlier generally don't have any numismatic value; their value is derived solely from the silver content they contain plus any current market premium. 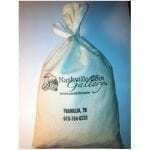 Each coin contains 90% silver and 10% copper, with any combination of $1 in face value equaling approximately .715 ounces of pure silver. We say "approximately" .715 ounces because, when the coins are in brand new, mint condition, they contain .7234 ounces of pure silver for each $1 in face value. However, to account for average (but not excessive!) 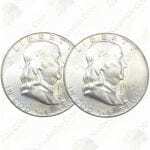 wear and tear, since silver is a soft metal and wears down easily, the industry standard used by most coin dealers is an assumed content of .715 ounces for each $1 in face value. NOTE: Pre-1936 Silver Dollar coins are not considered "junk silver"; they are in a category of their own -- and interestingly, when a silver dollar is in brand new, mint condition, it contains .7734 ounces of pure silver, exactly 1/20 of an ounce more than $1 in face value of smaller denomination 90% silver coins! 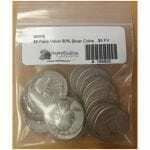 Purchasing United States 90% silver coins is a very popular way to invest in silver. Because they were produced by the US Mint and used in circulation for a number years, they are extremely recognizable and liquid. Also, the small denominations they come in could be particularly advantageous in a hypothetical situation where bartering for food or other necessities became necessary if fiat currencies, such as the US dollar, started rapidly losing value relative to precious metals, or became worthless altogether. While it's not necessarily the cheapest way to buy silver, the small size, the ease of recognition and familiarity, and the "brand name" of having been made by the US Mint make 90% United States coins one of our top recommendations for those interested in investing in precious metals. Often referred to as “junk silver”, circulated, common date Unites States 90% silver coins such as dimes, quarters and half dollars dated 1964 or earlier generally don’t have any numismatic value; their value is derived solely from the silver content they contain plus any current market premium. Each coin contains 90% silver and 10% copper, with any combination of $1 in face value equaling approximately .715 ounces of pure silver. We say “approximately” .715 ounces because, when the coins are in brand new, mint condition, they contain .7234 ounces of pure silver for each $1 in face value. However, to account for average (but not excessive!) 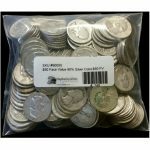 wear and tear, since silver is a soft metal and wears down easily, the industry standard used by most coin dealers is an assumed content of .715 ounces for each $1 in face value. 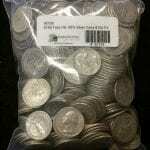 NOTE: Pre-1936 Silver Dollar coins are not considered “junk silver”; they are in a category of their own — and interestingly, when a silver dollar is in brand new, mint condition, it contains .7734 ounces of pure silver, exactly 1/20 of an ounce more than $1 in face value of smaller denomination 90% silver coins! 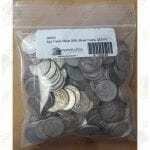 Purchasing United States 90% silver coins is a very popular way to invest in silver. Because they were produced by the US Mint and used in circulation for a number years, they are extremely recognizable and liquid. Also, the small denominations they come in could be particularly advantageous in a hypothetical situation where bartering for food or other necessities became necessary if fiat currencies, such as the US dollar, started rapidly losing value relative to precious metals, or became worthless altogether. While it’s not necessarily the cheapest way to buy silver, the small size, the ease of recognition and familiarity, and the “brand name” of having been made by the US Mint make 90% United States coins one of our top recommendations for those interested in investing in precious metals.